Zee Media is embarking on a talent hunt journey aiming to recruit future journalists and reporters for Pan India. The programme is open to students of all streams (i.e both journalism and non-journalism students are eligible for the selection process). The students will be trained to become multi-lingual, multi-format journalists skilled in the latest tools and techniques including Mobile Journalism (MoJo) and Artificial Intelligence. The Zee Aptitude Test is scheduled for 27th January 2019 (Sunday) from 10 am to 12 pm. Should Hold a Bachelor’s Degree and have secured a minimum of 50% marks or equivalent CGPA. The degree has to be awarded by any of the Universities included by an act of the central or a state legislature in India, or any other educational institutions established by an act of Parliament or are declared to be deemed as a University under Section 3 of the UGC Act, 1956, or hold an equivalent qualification recognized by the MHRD, India. Applicants who are appearing for the final year of their bachelor’s degree and the candidates who have completed their graduation degree requirements and are awaiting results are also eligible to apply. The Zee Aptitude Test will be a paper-pencil exam and feature a combination of General Knowledge MCQs and subjective essay-based questions. A pan-India national written examination called the Zee Aptitude Test (ZAT). Interviews with Editorial and HR. 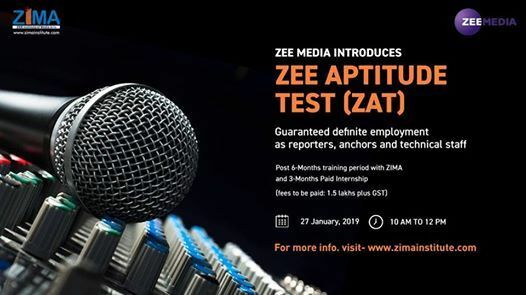 Post their selection into the training program, students will be provided guaranteed job offer letters from Zee Media (offer will be honoured subject to their successful completion of the training course). The training period will be for a total of 9 months starting from April/ May 2019 and shall be delivered by Zee Institute of Media Arts (ZIMA); for which students shall have to pay INR 1.5 lakhs + GST as fees. Loan facility is available on Course Fee from Essel Finance for the selected students. Payments can also be made in Installments. The training includes 3 months of paid internship in Zee Media with a stipend of INR 10,000 per month. Post the completion of the internship, the student will be employed by ZMCL.